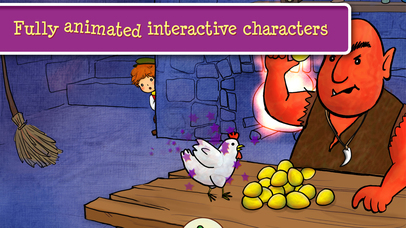 Coloring Storybook-Jack and the Beanstalk is a fun storybook app with a twist. Not only will children get to enjoy the classic story of Jack and the Beanstalk, but they also get to enjoy a bit of fun coloring throughout the story as well. With narration throughout and lots of interactive images to add a bit of interest, this coloring storybook is a great app for children of all ages. Coloring Storybook-Jack and the Beanstalk is full of wonderful, brightly colored images that children are going to love. The set up is quite intuitive and easy to use for children of all ages as it includes arrows to move through the pages as well as a brief ‘how-to’ introduction for children to follow. 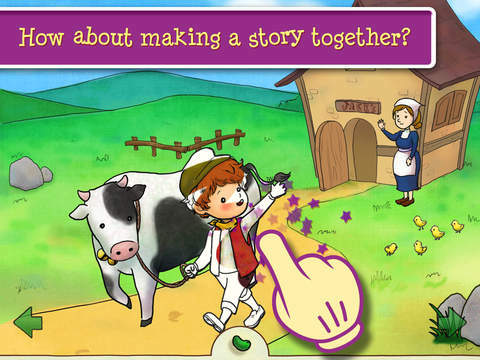 With narration through out, interactive images, and the words of the story included for children to follow along, this app is lots of fun. 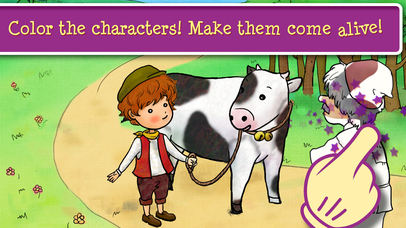 As with most storybook apps there is generally always an opportunity for children to practice their reading skills as they move through the story and Jack and the Beanstalk is no exception. 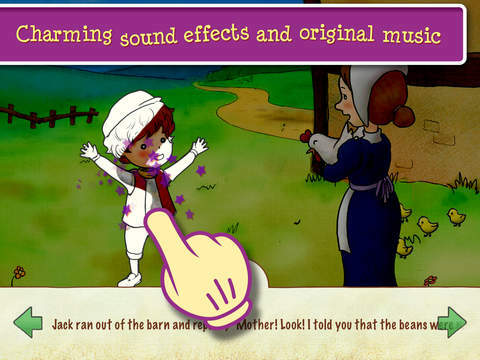 This app includes not only narration for children to enjoy, but also an option to follow along with the words of the story by tapping the bean at the bottom of the page. The only downfall is that text-highlighting is not included and it requires children to continually tap the arrows to see all the text as they follow along. Adding the text highlighting option is ideal as it would create an opportunity for children to be able to learn new words and practice their reading skills as they follow along. 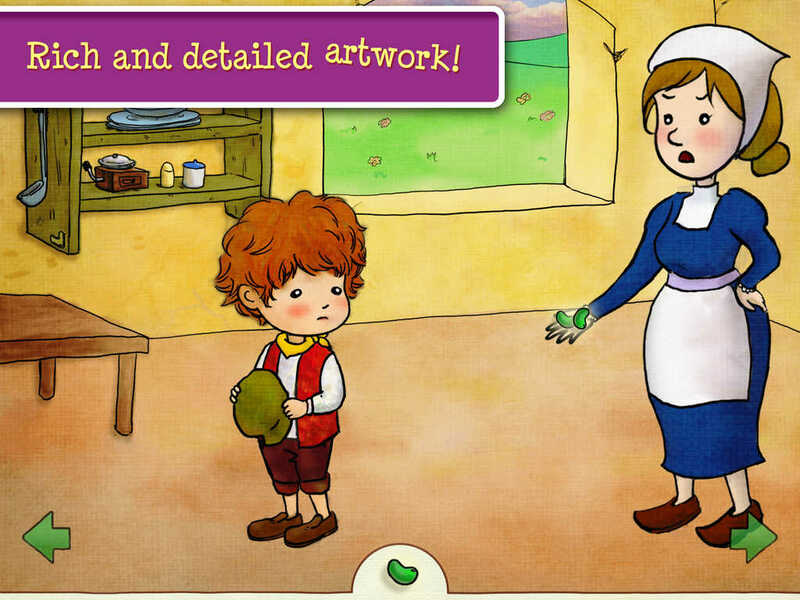 I love storybook apps that include interactive illustrations and additional activities for children to enjoy and this app does that with the added coloring component in addition to the story. As children follow along, there are various images that when colored come to life and create a bit of interest and engagement for young children as they read. By simply moving their finger back and forth on the image, the appropriate colors fill in and the image jumps to life. While the added coloring aspect of the app is fun for children, it would also be nice to have a few coloring pages for children to enjoy in a separate section of the app to increase engagement. 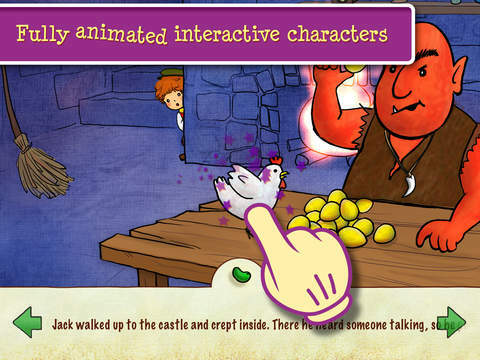 Priced at just under three dollars, this app is priced well for storybook apps. The narration, interactive images, and the coloring aspect of the app makes it one that children will enjoy and get a lot of playing time out of and it is at a price parents will certainly appreciate. With brief instructions at the beginning of the app, narration through out, and arrows to indicate when to turn the page, the developers have created an app that is very easy and safe to use for children of all ages.